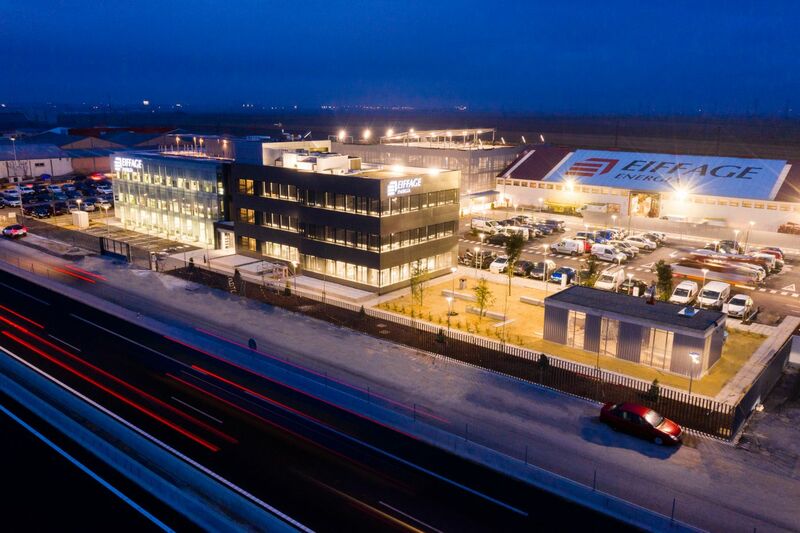 Eiffage Energia’s new head office in Spain, located in Albacete, is aimed at being a benchmark in Sustainability and Energy Efficiency, as it could not be otherwise. For this reason, the installations incorporate technical specifications of eco-efficient materials and systems and installations that increase efficiency and reduce consumption and, therefore, the impact on the environment. The complex is equipped with photovoltaic solar installations, aerothermal solar installation and biomass plant, rainwater recovery system for irrigation; integrated LED lighting with DALI control, recharging points for electric vehicles or BMS System for monitoring and control, among others. In this way, regarding the photovoltaic solar installation, the building has a total installed capacity of 60 kW, which will be completely intended for consumption of the complex, which represents a contribution of 25% of the total energy needed by the facility, which also has storage batteries and an intelligent charge management system. Eiffage Energía’s new head office also has a system for producing hot water consisting of a solar collector and an aerothermal boiler with a total installed capacity of 16 KW, so that the production of hot water is combined from these two systems to supply toilets and changing rooms in the building. 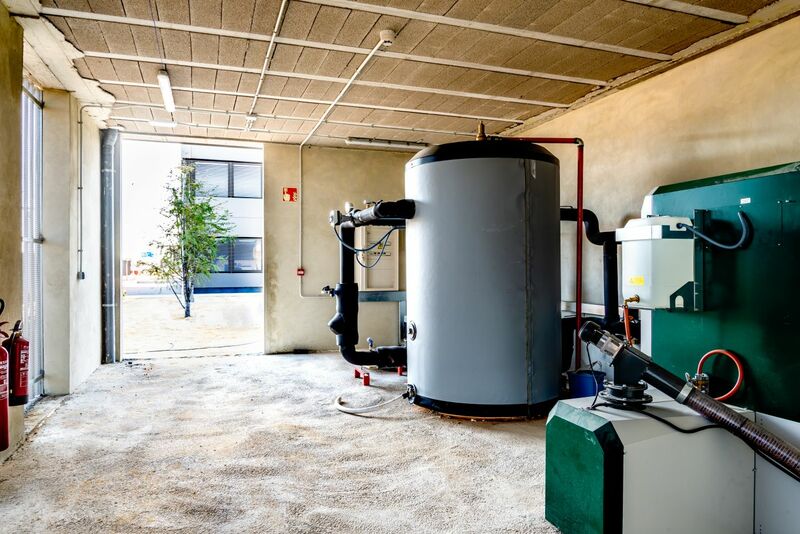 The complex has a biomass boiler with pellet feeder with a total power of 100 kW. The total heat production is utilised in the facility’s air conditioning system, this production being supplemented, on occasions when temperatures are very low, with two heat pumps for producing heat and cold respectively. To supply irrigation to green areas of the complex a rainwater harvesting system has been designed comprising a tank with a capacity of 30 m³, which collects all the water from the roofs of the office buildings and the car park, as well as that collected from the complex, all the content being filtered and stored for subsequent delivery to the irrigation system, saving all the water for the system. All lighting equipment installed has LED light source technology, achieving energy savings of up to 40% compared to the previous conventional equipment. Furthermore, to achieve a higher degree of energy efficiency, the regulation system has been equipped with centralised DALI control, which allows to regulate the level of illumination supplied according to the needs of each moment. 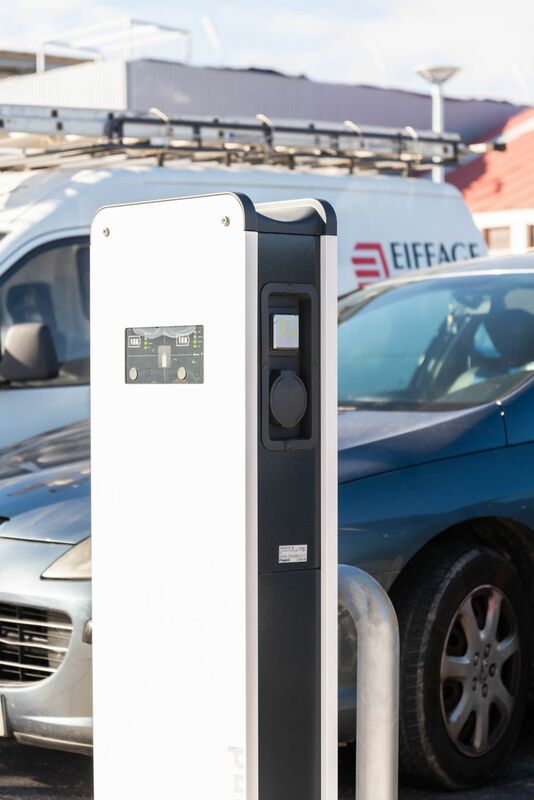 A total of 10 outlets for recharging electric vehicles have been installed, for recharge modes 2 and 3, each one equipped with a three-phase power outlet and another single phase, to meet the demand of 90% of the electric vehicles available today. It has also developed a system for management, monitoring and control of the installations throughout the whole complex or Building Management System (BMS), with more than 30,000 integrated control points relating to air conditioning systems, lighting, energy measurement, monitoring states of electrical protection, access control, security and video surveillance. Installations aimed at achieving maximum energy efficiency and lower environmental impact , and at becoming a role model inside and outside its activity areas.